Ben Milton’s Maze Rats is a traditional fantasy RPG ruleset in 13 landscape-oriented A4 pages (the last of which is a pair of character record sheets for printing). There is no art. Ben also runs the Questing Beast Youtube channel, the most active (as far as I know) video DIY D&D RPG reviewer. Maze Rats started as a hack of Into the Odd (which I discuss here) and still occupies nearby design space, though there is less implied setting. 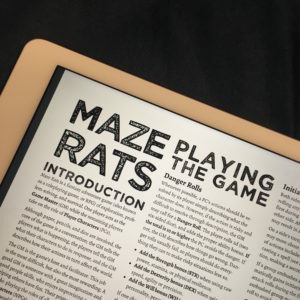 Maze Rats relies only on six-sided dice. For best results, players should have dice with different colors for the 36 item tables described below. 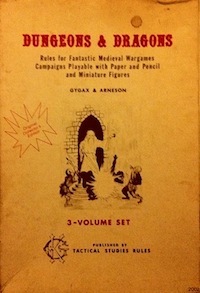 The player-facing system uses three stats (strength, dexterity, will) and resolves outcomes using 2d6 + stat with 10 or higher indicating success. There are a number of other ad-hoc systems, such as the familiar side-based d6 initiative, but the 2d6 ability check is the workhorse. The standout rule for me is the simple but flexible class-free advancement system. The random spell creation and atmospherically named character features (briarborn, fingersmith, etc) are runners-up. My least favorire rule is XP rewards for “overcoming challenges” (I prefer more impartial and concrete rules in this area). It is a minor point though and trivial to house-rule. Approximately eight of the twelve text pages are mostly consumed by 36-item lists used to jumpstart game content. For example, there are lists of clothing adjectives, mutations, monster traits, and so forth. Each list is essentially a two-dimensional (6×6=36) d6 random table where you roll one d6 for the first blob of six possibilities and another d6 for the particular possibility within. This is clever but I still wish there were numbers on the lists (the d66 notation some games use would work well). Many tables belong to sets that work together. For example, monster = animal base + feature + trait + ability + tactics + weakness. Random adventurer. STR +1, DEX +0, WIL +2, health 4, roofrunner (advantage when climbing, leaping, balancing), athletic appearance, tattoos, background: headsman, perfumed clothing, personality: stubborn, mannerism: overly casual, blah blah choose some more gear (random rather than alphabetic arrangement of the item d66 table would allow items at least to be done with a single d6 throw). I think I randomly generated Vin Diesel, or maybe wannabe Vin Diesel (given the physical stats). Random spell. Formula: physical effect + physical form, name: resurrecting sentinel (the first word came from the physical effect table, the second from the physical form table). I think this probably animates a receptacle using a piece of the sorcerer’s soul (temporary max health reduction) which will attempt to raise allies that have fallen to zero health (STR check). The resurrection check risks bad necromantic voodoo (WIL check). Random monster. Aquatic, anglerfish, gills (no too boring, roll again: plumage), colossal, spell-casting, tactics: ambush, personality: mystical, weakness: moonlight. So the anglerfish lure is clearly a fully-sized humanoid and this cyclopean peacock fish is trying to gather an army of hypno-drones to somehow get rid of the moon or block its influence. These were the first three elements I used the rules to create and all turned out interesting so I count that as a system success. 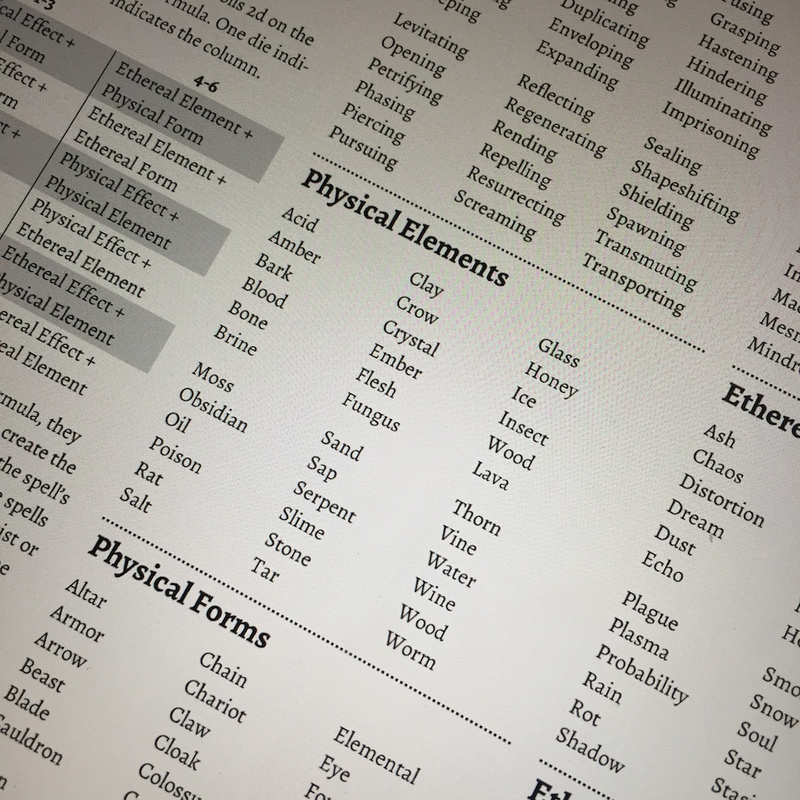 There are more sets of tables for other game elements (cities, wilderness areas, dungeons, and so forth). As written, players randomly generate new spells during each recovery, which must be interpreted and defined. It seems like this would create wonderful opportunities for player creativity. At some level, however, this also makes all magic-using characters functionally identical given that they are all rolling on the same tables. As a player who tends toward magic-using characters, I might want more individuation. 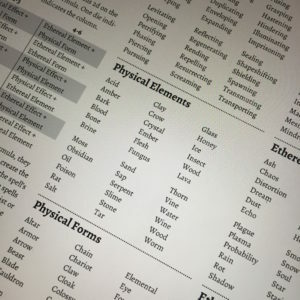 There are a number of easy ways to push this system into more adventurer-personalized territory without jettisoning the novelty benefits of regularly determining random spells. Possibility 1: characters can prepare current spells again if desired rather than randomly determining a new spell. Possibility 2: characters can choose specialization defined by fixing results for one or more of the tables used to generate spells. For example, one sorcerer may be able to choose physical form spells while another may be able to choose spells with deceiving ethereal effects. Possibility 3: characters can record particularly desirable spells in a library at some cost. This would allow each sorcerer to build a unique collection of spells. Cost could be monetary, specific sympathetic component (probably requiring adventuring), or both. I would find this last library option particularly satisfying as a player. Any or all of these approaches could be used together. The referee advice (last two pages of text) is gold. The principles are basically distilled community practices for a game focusing on exploration, lateral thinking, creative problem solving, and so forth. The advice may not be unique to Maze Rats, but it is tightly written and clear. I know of few better sources for concisely explaining what to prioritize when running this sort of game. 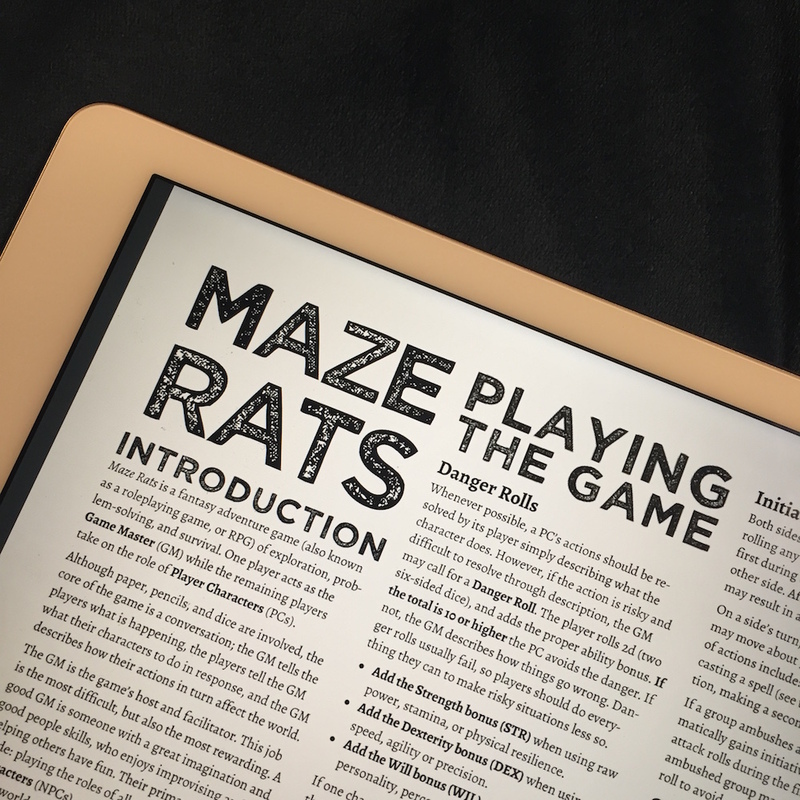 As I began reading Maze Rats, I was expecting another set of old school house rules, some of which might be useful to me in my continuous project of rules experimentation. What I found was a tight, well-written system with strong identity. I am curious if the lightweight chassis can stand up to an extended campaign. Currently, Maze Rats is pay what you want on RPGNow. It has a creative commons license so you can hack it and publish what you make. Disclaimer: Ben reviewed my book Wonder & Wickedness positively and includes my name in the thanks section of Maze Rats. This entry was posted in Reviews on January 2, 2017 by Necropraxis. Nice review! Just want to point out, Into the Odd relies on having all the normal DnD dice. Thanks for the note. It has been a while since I have read Into the Odd. Will update the review text to reflect the dice requirements. Not bad at all. I may try running my next campaign with this. That monster feels very Kingdom Death:Monster – but I think that’s a good thing. Sounds like an interesting system. Well, Dark Souls and Kingdom Death are my primary muses recently so I take that as a compliment of the highest order!